https://c2.staticflickr.com/4/3879/33489201005_93476436c0_d.jpg Female long cuts include extra sized pockets on either side that are stitched into the lining so they wont hang down with weight. https://c2.staticflickr.com/4/3695/32675281763_291d23fe49_d.jpg https://c1.staticflickr.com/3/2810/33333430322_5a894cdb0e_d.jpg https://c2.staticflickr.com/4/3749/33489238425_9a94d0725a_d.jpg https://c2.staticflickr.com/4/3770/33489201415_4cde299d0f_d.jpg Here is a fish who wanted to travel so badly that he did some out of the box thinking and got a specially made fish tank complete with legs. A good metaphor for life. https://c2.staticflickr.com/4/3782/33333429422_d2f218b5b6_d.jpg https://c1.staticflickr.com/1/634/33153923441_6bc1d53233_d.jpg https://c2.staticflickr.com/4/3715/33126551292_4ebcb3f9a7_d.jpg sizes may vary by up to 2cm /Product Info/ Here is a fish who wanted to travel so badly that he did some out of the box thinking and got a specially made fish tank complete with legs. A good metaphor for life. Here's the same design in white: https://www.pinkoi.com/product/1_n53Lrg /Material/ Our apparel use 100% combed cotton with reinforced ribbing in our collars to guarantee that it keeps its shape like new even after multiple washes. We also use flexible ink in our screen printing which stops those annoying cracks that can pop up in printed t-shirts. Each design comes in female dress and unisex traditional t-shirt versions with sizes from small to extra large. /Brand Info/ “It’s the little things that make you happy” Our Peej family is made up of many characters, each with his own little story. The word ‘Peej’ literally means someone that can make you laugh. We hope that our little guys can do just this; to make you happy just by looking at them and to be the perfect accompaniment for your day to day lives. 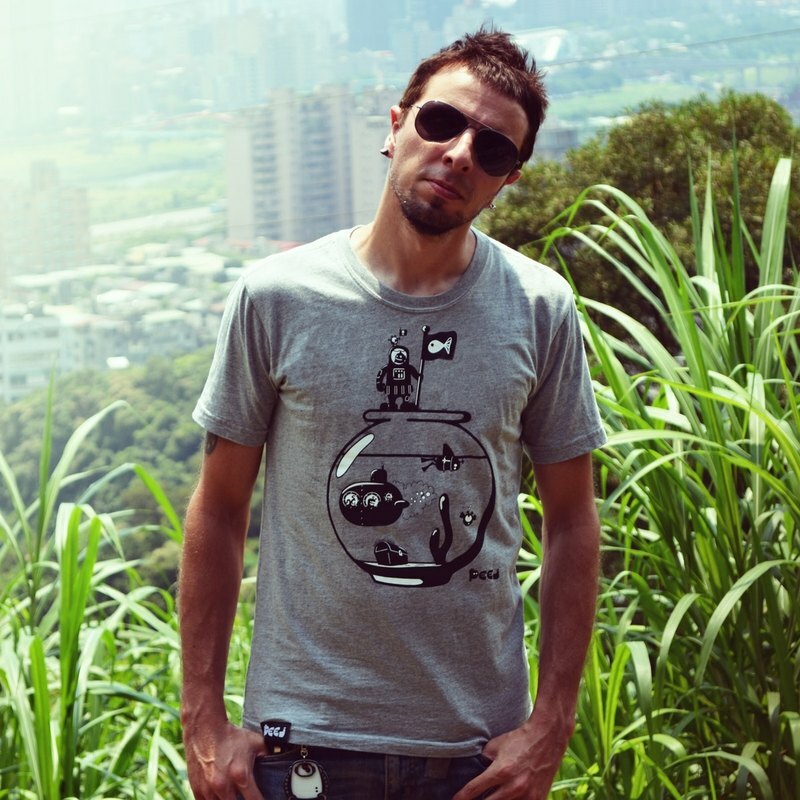 /Designer info/ Paul originally moved to Taiwan in 2000 and began his life here in education. After some time, he started designing teaching material for young learners and before long he realized that designing was the thing that he had come to love. And so came Peej: a natural progression which still revolved around the most important fundamental; making people smile. https://c2.staticflickr.com/6/5621/31255305256_ecb5e9d6cb_d.jpg https://c2.staticflickr.com/6/5560/30923536730_337b8e9b43_d.jpg When you order any of our characters or T-shirts, there will be a small gift in the form of badge or sticker added too. Made in Taiwan!